A letter of intent is a document executed generally by businesses to outline the basic terms of a commercial transaction, whether that be a complicated sale of goods or services or a real estate transaction. A letter of intent is entered into in the early stages of negotiation, when major obligations and expectations have been agreed upon, but specific details have not yet been determined. 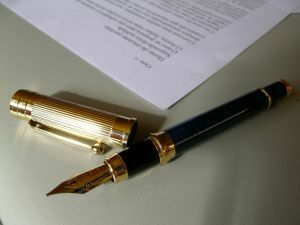 Letters of intent are useful in negotiating complex commercial transactions since they can provide a basic foundation of the understandings between the parties prior to taking part in lengthy and expensive research, investigations, financial review, environmental inspections, or other due diligence that must be conducted prior to the execution of a formal contract. Perhaps the most important concern in drafting a letter of intent is whether the parties intend for that letter, or any sections of it to be binding. If the letter of intent resembles a contract too closely, under New Jersey contract law it could be considered an enforceable contract when the parties have actually yet to finalize the details of their agreement. That result could potentially leave one party unable to avoid a transaction that, following further negotiations or due diligence, proves to be unexpectedly disadvantageous. However, if the parties want the letter of intent to be binding, it is important to ensure that this intent is clearly set forth and agreed upon in the language of the document. In many cases, letters of intent include both non-binding and binding terms which should be clearly delineated in the document itself. Certain sections of a letter of intent, such as a confidentiality or non-disclosure clause, will generally be considered binding because they are immediately applicable at the start of the negotiations. For instance, if the parties need to exchange information during the negotiations which is private, includes trade secrets, or is otherwise confidential in nature, it only makes sense that the confidentiality clause in the letter of intent be immediately binding upon the parties. Likewise, provisions such as those which promise exclusive rights to negotiate are also more likely to be binding since they too are immediately applicable while negotiations are continuing. In a recent New Jersey case in Hudson County, the court determined that a letter of intent for a $50 million real estate transaction which would have converted a parking lot into hundred of rental apartments was not enforceable against the sellers, at least with regard to forcing the sellers to proceed with the sale. Prior to execution of a final agreement, the potential buyers incurred approximately $750,000 in engineering, legal, and other fees in the process of conducting due diligence on the property and plans for the transaction and potential use of the property. However, the judge noted that even though the fees incurred by the potential buyer were high, they were not enough to require specific performance from the sellers. One of the judge’s most significant considerations was that it was clear from the letter of intent and the parties’ negotiations that they only intended to be bound by a final and fully executed purchase agreement. McLaughlin & Nardi, LLC’s attorneys are experienced with all types of business transactions including complex commercial and real estate transactions. Our attorneys are also experienced with drafting contracts and letters of intent and can advise clients on how to proceed with their transactions in a way that is to their greatest advantage. To learn more about what we may be able to do to help, please visit our website, or contact one of our New Jersey lawyers by e-mail or telephone at (973) 890-0004.